I like these, even though they're not my usual colors. Reminds me of forests in NE in the fall, looking at maple tree colors through a screen of pine trees. 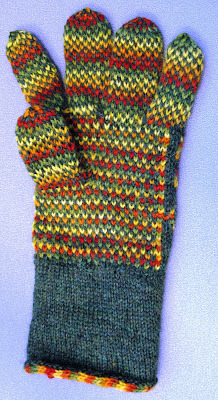 The working of the inner wrist liner going perpendicular to the rest of the glove came out pretty well, though I had to rip out and restart 4 times to get the math just right. Knitting math and I need a long time to get in synch. Theoretically I know what to do to calculate gauges and based on that how many sts. I'll need for a given piece, but it never quite works out. Getting old is nice though. I knit on the ski machine so I don't mind re-do boring st. st. things because hey, what else am I going to do while walking for 40 minutes and watching MI-5???? 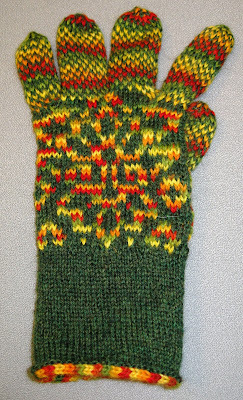 Wow...Like the knitting pattern of Gloves. It was nice going through your blog. keep it up the good work.